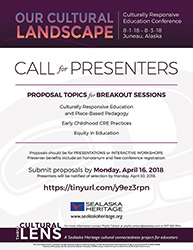 Sealaska Heritage Institute (SHI) is accepting proposals from educators for breakout sessions to be held during its second Culturally Responsive Education Conference in Juneau this August. The proposals should focus on one of three areas: place-based teaching and learning; early childhood culturally-responsive education practices; and equity in education. The deadline to submit proposals is April 16. Proposals should be in presentation or interactive workshop format. Presenters are eligible for travel, lodging and an honorarium. The conference is part of SHI’s education program Thru the Cultural Lens, which gives cultural orientations for educators in the Juneau School District. SHI’s first cultural education conference was held in 2017 and drew about 140 educators from as far away as Nome and Fairbanks.